What’s the best way to massively update a big table? A thing that can happen once in a while in a DW is the need to massively update a column in a table, let’s find out. No other NonClustered index will be included in the base table. You should already know that each NCIndex that contains the updated column in its key (or includes) needs to be updated too, but that’s a no brainer: if I have such index on the table (especially if the updated column is the Key) it’s better to just disable it and rebuild the Index right after the massive update. Let’s get to the results (on my machine) presto! WHY? HOW? What’s the Mistery Item?? This needs to be explained. 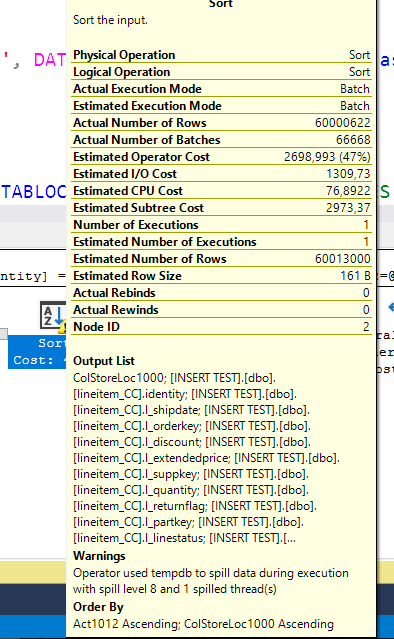 This is an actual plan; in a decent&recent version of SSMS (I’m on the latest as of now, 17.5) and SQL Server, if you highlight an item and press F4 (or right click and select properties), the properties plan comes up and you’re able to see the Time and IO statistics for each item, without having to specify “SET STATISTICS TIME, IO ON;” as you would usually do. Most of the time is spent here actually updating the table, scanning the whole table for the values is actually a fast operation because it’s done in parallel, it takes less than 14 seconds total. The update itself, by contrary, is done by a single thread, which has to jump around between the various (unordered) pages of the heap to update them. I know, you’re thinking “of course it’s faster, your predicate is on the clustering key, it will be a different story if the predicate is on another column”, which is what I was thinking, too. “But is it pushing the predicate down?” Once and for all, to exclude this, I tried to change the predicate column from [identity] to [l_quantity] (since they have been updated before, the same number of rows would be updated) and I couldn’t find any difference in runtime. It’s the UPDATE Operation itself that in a Clustered Index is faster, totaling at half of the Heap runtime! Why did you do this to me? I TRUSTED YOU! I TRUSTED THE BATCH MODE! Spill level 8 ? That’s a BP-level spill! But is it really the worst offender? So, we’re in a bad situation, but not the worse, because the sort operator finishes just over 2.5 minutes, so where are the other 7.5 minutes at? in the index update, of course. While the read of the pages from disk and the sorting were made in batch mode (even thou, why are we sorting again?) the update itself is a painfully slow single threaded operation (yes, even with the TABLOCKX hint) in row mode. 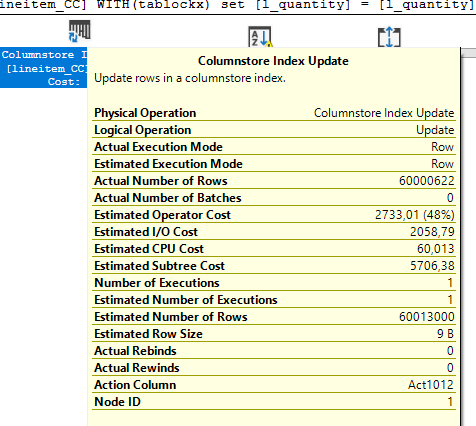 That’s because the update of the Columnstore Index is done by deleting rows (updating the Delete Bitmap) and inserting the new rows with the updated value in the Delta Store (which is basically a classic b-tree index) which is then compacted by the Tuple Mover as soon as possible; There is no “physical” update statement. To be fair, I didn’t tell you everything in the previous paragraphs to keep the suspense, if you had the feeling that something was off, you’re right, congrats! Have you noticed anything else off between the two plans? In the parallel plan, the update statement is reading 30M pages, which is exactly the number of rows to be modified! Coincidences? I don’t think so. In fact, the table doesn’t even have close to that number of pages, in fact, it has “only” 1175073 pages. 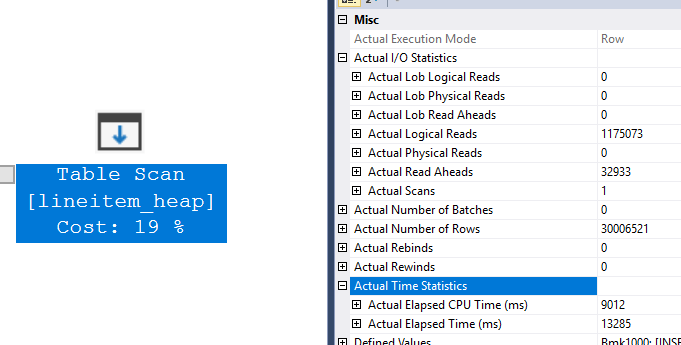 By analyzing the wait stats during the parallel heap update, you’ll notice that there is a big number of CXPACKET waits (about 320s in 60s), and, since I’m using SQL Server 2017 CU3, CXPACKET is definitely the actionable part of the parallelism wait (read more about CXPACKET and CXCONSUMER for SQL 2017 here). So in this case WE ARE waiting for parallelism! The Table Update is a serial operation regardless, but when dealing with a parallel table scan, which continuously feds data to update from multiple threads, it has to access each single row that it needs to update. 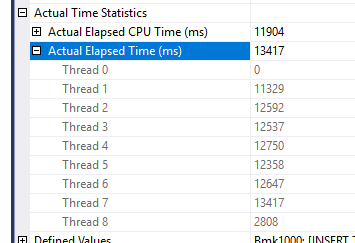 8 threads that read are faster than 1 thread that writes, hence the CXPACKET waits. The lesson is basically always the same: TEST, TEST, TEST. I’ve tested this for you, but results may vary and each workflow needs its own test.